According to data released by The College Board, the median SAT test taker scored 1010 (on the ‘old’ SAT testing format) — a 496 on the SAT’s critical reading section and a 514 on the math. The median student whose family earns less than $20,000 scored just under 900 – a 435 on the critical reading section and a 462 on math. 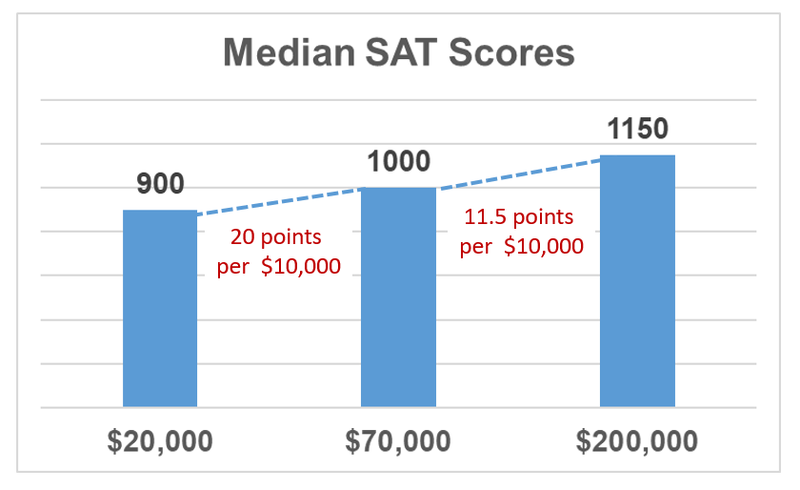 Students from families earning $60,000-80,000 perform similarly to the overall distribution with a median score of about 1000. The median student from a family earning more than $200,000 per year scores 1150 – 565 on critical reading and a 586 on math. In other words, the data suggests that there is a significant relationship between family income and SAT scores. Students from middle class families score about 11% higher than low income students. That works out to about 20 SAT points per $10,000 in family income. Students from higher income families score about 14% higher than middle income students. That works out to about 11.5 SAT points per $10,000 in family income. Undeniably, there’s a strong positive correlation between family income and SAT scores. But, correlation does not prove causation. Obviously, income doesn’t directly impact SAT scores. Kids from high income families may come from better stock. SAT scores correlate strongly enough with IQ that the SAT is interchangeable with IQ as a test of general cognitive ability. Cognitive ability is highly heritable; the single strongest predictor of a child’s IQ is the IQ of the child’s parents. There is also a correlation between income and IQ. In other words, many high earning parents have high IQs, a high level of educational attainment … and smart kids who do well on the SATs. Kids from high income families typically have better educational opportunities. Also undeniable, students with better educations do better on the SATs. Richer people tend to cluster together geographically in communities that have superior schools. It’s a simple matter of funding, parental involvement and school choice. And, if the local public schools aren’t effective, rich parents have the option to send their kids to private schools. So, it’s not a simple matter of money buying SAT points. It’s a matter of income ‘marking’ strong DNA … that’s effectively honed with superior educations. This entry was posted on March 22, 2019 at 6:59 am and is filed under College Admissions, SAT - tests. You can follow any responses to this entry through the RSS 2.0 feed. You can leave a response, or trackback from your own site.